On the second day of PEI Burger Love, I visited Urban Eatery. I actually wasnâ€™t thinking Burger Love today until I happened to be in the mall and noticed itâ€™s 11:50 AM! 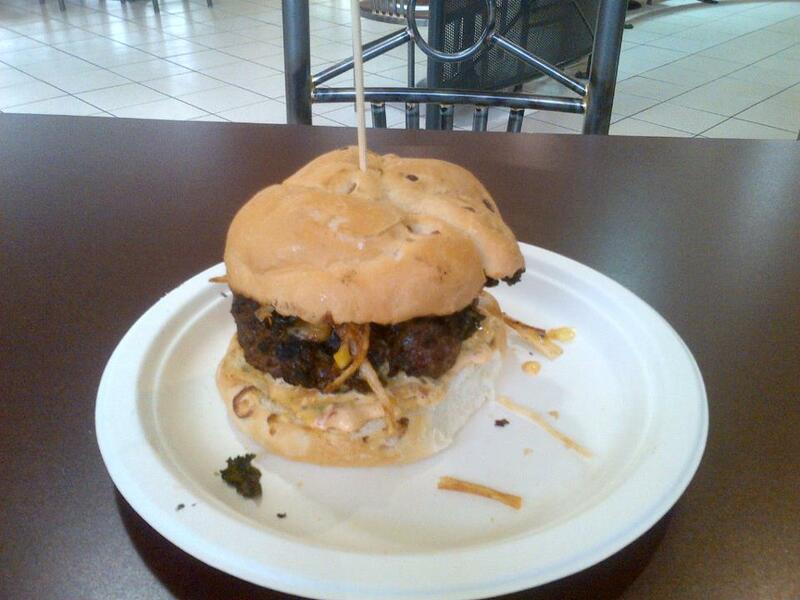 Urban Eatery is located in the Confederation Court Mall in the ol â€œfood courtâ€. It used to be a bunch of different shops years or ions ago but was re-modeled all as one. Obviously anyone who has been to Urban Eatery knows you canâ€™t really rate the service as easily as you can at other locations, itâ€™s not your typical sit down and be served style restaurant. You simply get your foot in a cafeteria style restaurant and then go sit down. So, I ordered up their Burger. They also offer fries for an extra $1.50 which I declined. The service was what to be expected, friendly olâ€™ customer service. The interactions with the staff were as to be expected, pleasant and friendly. The cost of the burger was a minimal $10 which was a surprise as I was expecting them to be a bit more. I sat down and enjoyed the burger. The best part about it was without a doubt the beef. Meaty and juicy! The meal was obviously what was to be expected, being served on a styrofoam plate comes with the price tag. And at $10, it wasnâ€™t anything too special. Just a regular run of the mill burger. All in all, I was a bit surprised as I am a huge fan of their Mistress Burger, which is highly suggested.